Sunday morning we took off to Volterra to once again travel back in time to the Middle Ages. Volterra is the perfect setting with its medieval architecture and since the whole city is involved in one way or another, the festival has been a favorite of ours since we discovered it. This year, as soon as we arrived into town, we were surprised to be stopped along the road and asked for 4 euros for parking – anywhere we could find it around the city! Seems the town organized to further collect funds for parking in addition to the entrance fee. Last year, we had parked on a road on the outskirts of town since we had found no parking elsewhere and not paid at all. This time it didn’t matter how far you were, if you entered city limits you had to pay. As we entered the city, the beat of drums in the distance guided us in the direction of the fair. We soon found out that the festival had been drastically reduced this year, most likely due to budget cuts. 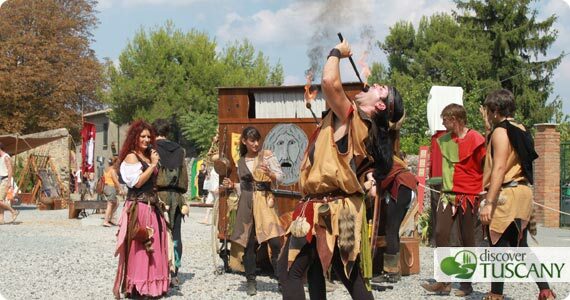 Last year, the fair extended over the entire park called E. Fiumi right next to the Medici Fortress and onto the San Pietro park to the north of the Porta a Selci; this year the entire fair was in the San Pietro park area which is pretty small. We dutifully paid our 9 euros each for entrance, got a stamp on the inside of our wrists to make coming and out a breeze and entered into the magical area of time travel. The village had areas that showed the main crafts of times past – men cleaning wool and spooling yarn, a woman working a loom to make cloth. The carpenters were busy cutting and nailing, the blacksmith heating and shaping a sword. Taverns were busy serving wine, bread and roasted meats while a small pork roasted on a nearby spit. Children played on a nearby small merry-go-round with wooden horses. Mendicants wandered among the people, priests passed by. Musical groups and jugglers offered entertainment in the middle of the summer heat. The medieval village was alive and busy. Some artists hung around to entertain the remaining public a few hours later but unfortunately the greater part of the fair and its atmosphere were ruined by the weather…. oh well! Let’s hope we get luckier on our next outing, wherever we might be this coming up weekend. The “Bravio delle Botti” is this Sunday in Montepulciano, we’re thinking about heading that way… will we see any of our blog readers there?